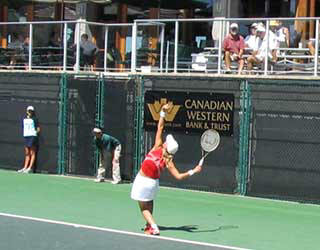 Angelika Bachmann of Germany, above, is serving to Sesil Karatantvheva of Bulgaria, the 15-year-old junior sensation, at the Odlum Brown Women's Open in Vancouver. Sesil won the match in three sets. The Jericho Tennis Club is hosting the tournament August 7 - 15, a WTA tour event with US$110,000 in prize money. Current WTA star Russian Maria Sharapova won the 2002 Open and went on to win the Wimbledon this year. German Anna-Lena Groenefeld, winner of the 2003 event, now ranks in the top 100. French Bartoli Marion is seed number 1 and ranks 56 in the world. This is the biggest women's tennis event here since the1987 Federation Cup. For those who want to recapture a glimpse of that 1987 tournament, click here to see US team members Zina Garrison, Chris Evert, Elise Burgin and Pam Shriver practicing at the West Vancouver Tennis Club. The media are out in force for the event, including Vancouver Sun photographer Stuart Davis, taking a shot of fourth-seeded Laura Granville on opening day, Monday (the shot appeared in the Sun's Tuesday edition). In the background is Granville's opponent: American Samantha Reeves.